Nai Roshni –Rural Litigation and Entitlement Kendra (RLEK) is empanelled with Ministry of Minority Affairs to conduct Leadership trainings for minority women under Nai Roshni scheme. 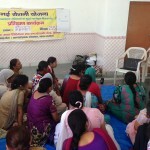 RLEK last year trained nearly 250 women under this schemes and plans to train 1000 women in this financial year in Dehradun district, under this scheme. RLEK along with NHRC and the International Working Group for Indigenous Affairs (IWGIA), organized a three day workshop on “Human Rights of Marginalised and Tribal Communities – The Role of NGOs and National Human Rights Commission in Promoting Human Rights Culture.” The main objective of the workshop was not only to equip the participants with the information and skills for educating vulnerable sections of society about their Human Rights but more particularly to develop a strategy to induce officials/ authorities, wielding power and exercising control over these people, to have respect for Human Rights and enforcement of human rights in cases of violation and selection of remedies to redress human rights violations with special emphasis on the role of NGOs in protecting these rights. Validation workshop on the study of Jurisprudence of Panchayati Raj Institutions (2005) – was organized seeking views of Members of the Task Force, Legal Luminaries, Decision Makers, Government Officials connected to Panchayati Raj Departments, Panchayati Raj functionaries, NGOs and other Social Activists like Mr. Wajahat Habibullah, Secretary Ministry of Panchayati Raj, Ms. Sudha Pillai, Additional Secretary, Ministry of Panchayati Raj, Mr. Pradeep Sharma, Assistant Resident Representative UNDP, Ms. Mithulina Chatterjee, Project Officer, UNDP. The views expressed in the workshop were taken into account for preparing the State reports and final integrated report. Two-day Workshop to validate the “Study to review the Subject laws which infringe upon the domain of the Panchayat Raj Institutions” was organized on 24th–25th May 2008 which witnessed the participation of Hon’ble Mr. Justice S.B. Sinha, Judge, Supreme Court, Hon’ble Mr. Justice Jagdish Bhalla, the then Chief Justice, Himachal Pradesh High Court; Mr. Justice Pradeep Kant, the then Senior Judge, U.P. High Court; Hon’ble Mr. Justice Surya Kant, the then Hon’ble Judge, Punjab & Haryana High Court; Mr. Justice Madan B. Lokur, the then Judge, High Court of Delhi and Hon’ble Justice Rajesh Tandon, the then Judge, Nainital High Court and Ms. Sushma Singh, Secretary, Ministry of Panchayati Raj participated. A two-day workshop on “Role of Panchayati Institutions (Local Self Governance) in protecting Human Rights and Promotion of Democracy” on 8th – 9th September 2009 was graced by Mr. Justice S.B. Sinha, (Retd.) Hon’ble Judge Supreme Court of India, Mr. Justice G.N. Ray, Hon’ble Judge, Supreme Court of India (Retd. ), presently Chairman, Press Council of India, Mr. D.R. Kaarthikeyan, Advisor of Law-Human Rights-Corporate Affairs, Former Director, Central Bureau of Investigation, Former Director General, National Human Rights Commission and Special Director General, Central Reserve Police Force. Rights of minority – RLEK has organized a series of three workshops at RLEK Dehradun, NALSAR Hyderabad and Aligarh Muslim University, Aligarh over minority rights and its awareness under the aegis of the Ministry of Minority Affairs. All the workshops were attended by two sitting Supreme Court Judges, three former Supreme Court Judges, former Chief Justice of High Court, Lokayukt, two chancellors of the Central Universities, three vice chancellors of the prestigious universities and various renowned academicians and professors, human right activists, social thinkers, senior journalists, students, civil society representatives. Around 330 people (panelists/speakers and participants attended these three workshops).The objectives obtained by the workshop for minorities were furthering the protection and promotion of the rights of minorities, provide an analysis of minorities protection as enshrined under the constitution and other law etc. Innovative training methodology – RLEK has a vast experience in conducting need based assessments and developing training modules/curriculum, training materials, facilitating stakeholder/ working group consultants, workshops and trainings and have a strong ability of involving key stakeholders. ) RLEK is a resource centre for training material preparation, developing area and need-specific modules for many states. It has not only devised innovative PLA (Participatory Learning and Appraisal) techniques and capacity-building training programmes to generate consciousness about the roles, rights and responsibilities. It has also developed innovative learning games to make learning fun and easy.